Interested In Carrying Crushi Items in your store? We have quantity discounts on unique items available for shipment today! 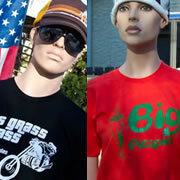 From our original Crushi Brand T-Shirts, 1970's Vintage Iron-Ons, to our Brand Iron-On Words and Mixed Vintage Lots look to us for stocking unique items that are popular with young hipsters and fashionable teens. We sell at discounts rates for large quantities of items. The Vintage 1970's Iron-Ons are only available in the quantities listed on the site... We sell to individuals, small business, or large chains. We don't discriminate... our prices are discounted by quantity... so the more you purchase the cheaper the price. Original 1970's Vintage Iron-Ons are seriously really hard to find and in 99% of cases we are the only ones that have them available. Include your business name and your phone number with a short email on what you are interested in and we will get right back to you. Crushi Custom Vintage T-Shirts (not shown): Using Original Vintage 1970's Iron-Ons in Combination with Brand New American Apparel Vintage Fit T-Shirts, we put together a package of Unique (most cases one of a kind) t-shirts for your small vintage specialty store or business... Must order 4 dozen or more at a time (does not include any of the designs or iron-ons shown on the site) and most of the cases they are one of kind items... contact for more information (very popular!!! ).